Having finished my Hottest 100 Beers Challenge a couple of weeks ago, I've taken some time to reflect on what was an excellent journey. I tried a number of great Australian beers that I otherwise wouldn't have re-visited and sampled a number for the first time. As is my wont; I've subsequently converted a lot of my Untappd data into a spreadsheet and had a play around. I was actually pleasantly surprised with my findings, some of which will be presented below. Heading into this challenge I felt sure I would try a number of below average beers. I made sure I entered this challenged with an open mind and found that a number of the heavily derided macro offerings are actually pretty decent beers - not beers I'd drink every day, but not bad beers either. To more positive findings; if you were a hoppy Red Ale you did very well in my rankings, five of them got scored at 4.5 or above on Untappd! Pirate Life make great beers that I drink a lot of (probably not news to many of you)! 2 Brothers from Moorabbin produced my best new find of the year; their Kung Foo Lager is delicious and something I probably would never have tried if it were not for this challenge. Stone & Wood Pacific Ale is a deserved champion. This beer is produced so consistently. They manage to maintain this consistency despite the huge volumes of the beer they must brew, across multiple sites now, to placate the masses of drinkers across this country that now drink this rather than macro lagers. Craft beer drinkers who complain about this are missing the bigger picture; it's better the masses drink a fantastic Australian craft beer like Pacific Ale rather than macro lagers. The playing field is slowly shifting in our direction. Simply; it's the best Australian Pale Ale and a deserved winner of back-to-back Hottest 100 popularity contest titles. I "ummed" and "ahhed" about writing this paragraph, but thought its not an objective piece if I abstain from criticism. I was surprised to find Gage Road Atomic, Little Creatures IPA & Hawthorn Pale Ale in my bottom five beers. I checked all the bottles and they were all well and truly within date... The Gage Road beer, in particular, was one of the worst beers I had last year - I even had a second Atomic which further confirmed this! Whilst Yenda Pale Ale, owned by Coca-Cola, was the only one of the macros to really disappoint. 29 - The number of beers I rated at 4.5 or above. Massively above my expectations! 5 - The number of beers I rated under 3. I was pleasantly surprised by a few of the macro offerings that are much derided. 4 - The number of beers from Feral that found their way into my Top 5! I was shocked by this, but by the criteria I set before analyzing any data (the only fair way to do this) War Hog, Watermelon Warhead, Hop Hog & Tusk all found their way into the Top 5 - behind Stone & Wood Pacific Ale. 69 - The number of places jumped by Thirsty Crow's Vanilla Milk Stout, in my rankings compared to the 2015 Hottest 100 voters. 86 - The number of places fallen by James Squire's 150 Lashes. It's a serviceable but certainly not one that'd find its way into my Top 10. 14 - The position that Brewcult's Milk and Two Sugars finished in 2015 - the highest ranked beer from 2015 to miss the 2016 Hottest 100. 146 - The number of places that Hangman Pale Ale from Rocks Brewing fell - from 36 down to 182 - I remembered to analyze the 101-200 Beers this year! 21 - The number of beers I tried for the first time (according to Untappd) as part of this challenge. 37 - The number of beers to fall out of the Hottest 100 in 2016, including the two beers from Coopers' which were not entered by the brewery this year. 23 - The number of beers to rise up the Hottest 100 countdown in 2016. 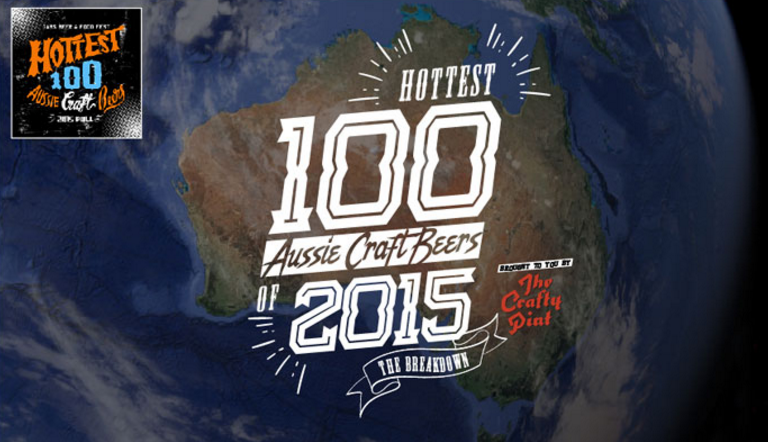 38 - The number of beers to slide down the Hottest 100 countdown in 2016. 2 - The number of beers to hold their positions in Hottest 100 2016, headlined by Stone & Wood Pacific Ale retaining its crown atop the countdown. 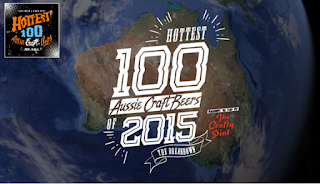 3.875 - The average Untappd score that I gave beers in the 2015 Hottest 100. This is significantly higher than I expected and just shows how far Australian beer has come! It's almost in-line with my figures across all of 2016! All in all I have to say that I'm very glad I tried the beers that the Australian beer drinking public voted as their favorites. Overall the quality of the beer being produced and consumed in Australia is better than I thought it was. The 2016 results, which you can find here, also show that more drinkers are moving away from macro craft beers and moving towards fuller flavoured independent offerings (as seen by the falls in James Squire 150 Lashes and Fat Yak in particular). 2017 is going to be a great year for Australian craft beer!